ORLANDO/FT. LAUDERDALE—Rep. Debbie Wasserman Schultz (D., Fla.) continued to evade questions about her efforts to block new Iran sanctions legislation in Congress when asked today about the issue during multiple public appearances on Saturday in Florida. Wasserman Schultz fled from a Washington Free Beacon reporter on two separate occasions when asked to explain her stance on new Iran sanction, which the lawmaker is reported to be lobbying against behind closed doors on Capitol Hill. The Florida lawmakers and Democratic National Committee chair made stops in Orlando and Ft. Lauderdale to publicly criticize and mock New Jersey Gov. Chris Christie, who is in the Sunshine State this weekend for a series of fundraisers with Republican activists. While Wasserman Schultz lashed out at Christie for "not answer[ing] questions in the press" about his trip, she fled a Free Beacon reporter and ignored multiple requests to explain her position on the sanctions legislation. Jewish community leaders in both Florida and Washington, D.C., have grown concerned about Wasserman Schultz’s efforts to block new sanctions legislation. She is believed to be one of the lead Democrats working behind the scenes to block new sanctions, the Free Beacon reported earlier this month. Those reports have since been echoed by outlets such as the Huffington Post and the Daily Beast, even as Wasserman Schultz has told media in her home state that she is not obstructing the resolution in the House. When asked Saturday morning at an event in Orlando if she would explain her anti-sanctions campaign, Wasserman Schultz demurred. "Congresswoman, can I ask a question?" a Free Beacon reporter asked as she walked away from her early morning press conference. 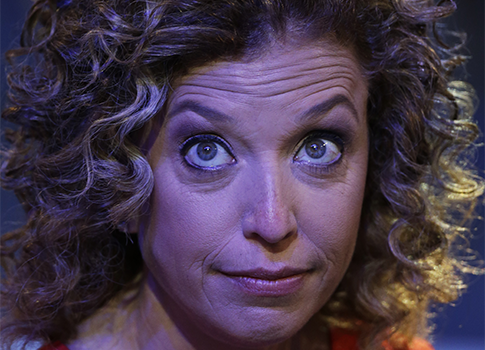 "We just have to get to the car," responded one of Wasserman Schultz’s aides, as the lawmaker herself stood silent. "I have one quick question, I was curious about your position on Iran sanctions," the reporter followed up. "I was curious if you might be able to talk to me for a second." "It’s nice to meet you," Wasserman Schultz responded, patting the Free Beacon reporter on the shoulder before getting into a car. She emerged from the vehicle less than five minutes later to do an interview with a local television station. Wasserman Schultz again evaded the Free Beacon reporter’s questions during an afternoon appearance in Ft. Lauderdale, where she again criticized Christie for not publicly answering questions. A Wasserman Schultz aide then refused to call on the Free Beacon during a question-and-answer session. "I have a question. I wanted to ask the congresswoman a question. Is that possible?" a Free Beacon reporter asked. "Are there any other questions," the aide responded. "Are you not going to acknowledge me? Is that possible? Is that how you deal with the press?" the reporter asked. Wasserman Schultz again evaded questions about her position on Iran sanctions when a Free Beacon reporter followed up for a second time. "I still have a question. What’s your position on Iran sanctions legislation? Can you please just answer the question?" the reporter asked. However, Wasserman Schultz walked away from the podium and continued to duck questions. "Will you still give me a minute ?" the reporter asked as Wasserman Schultz got into her car. Wasserman Schultz fled the scene. This entry was posted in National Security and tagged Debbie Wasserman Schultz, Iran. Bookmark the permalink.